Someone has to stop me!! I am besides myself with trying new recipes using my Homemade Bisquick Mix and I nearly ate this whole Pumpkin Coffee Cake by myself. Fortunately, I’m focusing on creating treats that are low fat and healthy, so I guess I can excuse it for now. It’s so wonderful to have quick and healthy options available in minutes. Making the homemade bisquick without any shortening has been such a time saver in the kitchen. 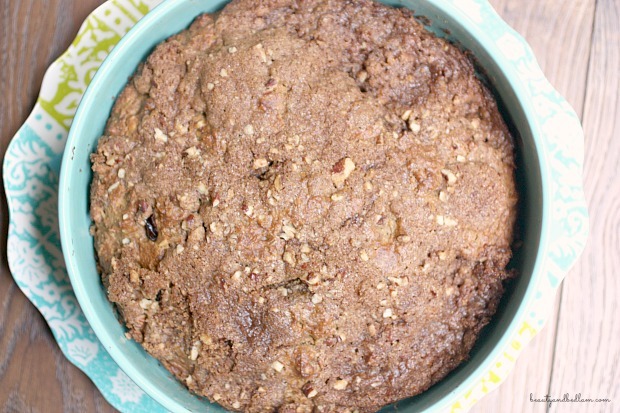 I’ve made this Pumpkin Coffee Cake a few times and the last time I whipped it up, a wonderful mistake occurred. I was out of eggs, but had already mixed all the ingredients except for the eggs. In the past, I’ve substituted both applesauce and bananas for eggs, so I decided to give some extra pumpkin (1/3 cup) a try and it was amazing. A bit more dense and moist than it typically is, but a great alternative if you are in a pinch or someone has egg allergies. My Easy Pumpkin Bar Recipe, with cream cheese frosting, is another favorite and I give options for a lighter recipe with those. In my Homemade Bisquick post I mentioned making up your own personal “box mixes.” It’s very easy to make them up in bulk as seen in my picture below. 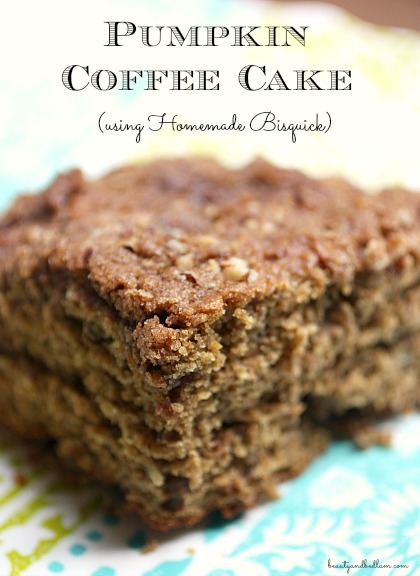 Summary: This delicious and healthy Pumpkin Coffee Cake whips up in minutes with my homemade Bisquick. 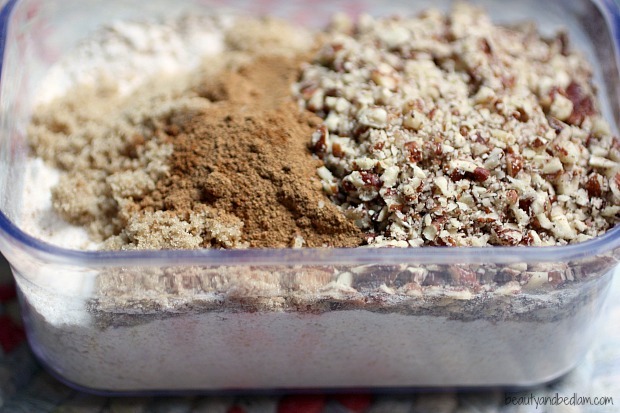 Mix together Baking Mix, brown sugar, cinnamon, ginger, cloves, raisins and nuts. Mix eggs, milk and pumpkin together. 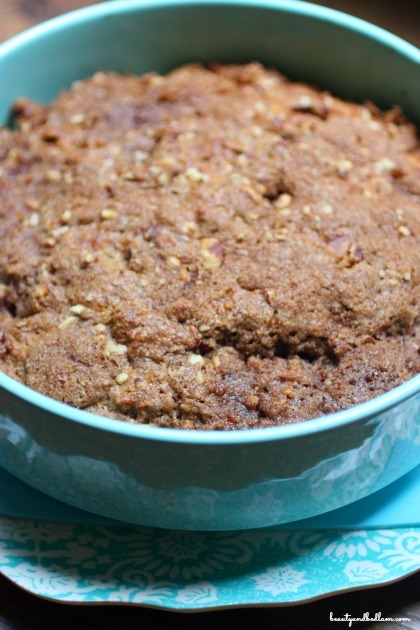 Spread batter in a greased and floured 8×8 baking pan. Combine dry ingredients and cut in butter until mixture is crumbly. Sprinkle on topping and bake for 40 minutes or until done. I can’t wait to try these. Love this concept! Thanks Elaine – it’s been so fun trying out different recipes using this quick mix. Hope you like it. Ok that just looks like heaven! I love fall… getting to add pumpkins to all my favorite recipes. This looks great!